So there they were. Two rats—crouched among the birds, squirrels, chipmunks and rabbits. It was February 2014 and an unexpected six inches of snow had fallen in the Portland area. I was keeping the food stockpile on the hillside high so the critters wouldn’t run out. That’s when the rats showed up. I live in the woods, so seeing rats in the area is not unheard of. At first they only came out at night, but after a few days they figured out the pickings were better when the two-legged creature without fur (also known as me) came though the magic door on the deck, and that was usually in the day time. The rats changed their tactics and started coming out in the morning. They stayed about six feet away as I strewed my goodies on the ground. Occasionally they would glance in my direction but for the most part they didn’t pay any attention to me. Periodically I’d see them chase off a small bird or chipmunk. Then they began chasing off the squirrels and rabbits. Chasing progressed to attacking. One rat sunk its teeth into a cornered chipmunk on the rock wall and the two tumbled about five feet to the ground, the rat holding on until the last minute. Thankfully, they both scurried off. The rats rose to the top of the food chain. They claimed the seeds, nuts and lettuce for themselves and did their best to keep the other creatures from getting anything to eat. My feelings went from interest in their habits, to respect for their tenacity in claiming a part of the bounty, to sorrow in observing their determination to take EVERYTHING even though there was more than enough for EVERYONE. This same, sad scenario is the basis for so much suffering on our planet. My heart ached as I watched the delightful dance of creatures on my hillside turn into a bloodbath. When the rats began scurrying next to my feet I became scared. Everything felt out of balance. I picked up as many of the seeds and nuts as I could, not an easy thing to do when you’ve been feeding the wildlife for over 23 years. The rabbits were the first to leave, followed by the birds, chipmunks and squirrels. The rats stayed. Pest control—the words gnawed at my heart. Who am I to determine what a pest is? Who am I to choose which creatures are worthy of life? 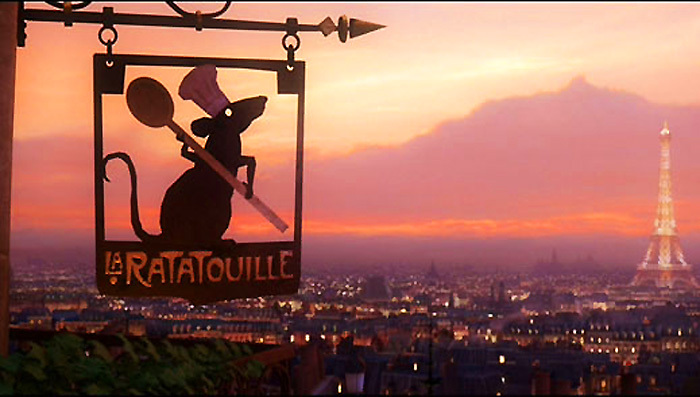 I’d seen—and loved—the movie Ratatouille. 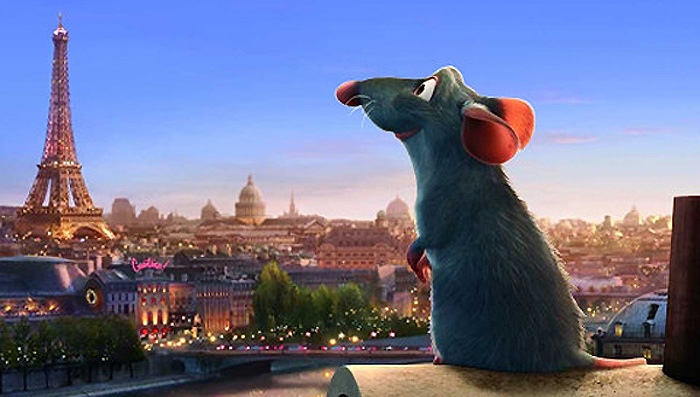 What if my rats were great chefs like the character in that film? What if the rats in my yard were prolific writers, tapping away throughout the night on tiny typewriters beneath my deck? What if they were there to inspire my next book? Despite those thoughts, I knew there was a good chance the rats could be creating babies. The image of many rats taking over my yard was too much to handle. I signed the deadly contract with the pest control company and they came and did the deed. A few weeks went by and the rats disappeared. In time I was able to begin putting food out on the hillside again. The birds, squirrels, chipmunks and rabbits returned and peace was restored among the feasters. Everyone got something. The rats reminded me how important balance is. I’ve needed to learn that lesson more than once in my lifetime. However, I’m haunted by the fate the rats suffered at my hand. Was the action I took any different from theirs? Did I do the right thing? Was there another option I could have pursued?